DecoDreams, Issue #008, Easy Storage Solutions! can't find, or waste energy looking at clutter. spaces, such as shelves, mantels, and curio cabinets. 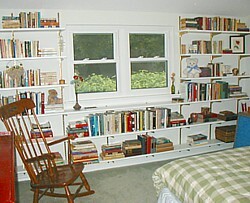 the shelving in this bedroom. decorating style of the room. collectible boxes, punctuate the arrangement. for the Casual Contemporary style that is created. display in your home? Think out of the box! with fabric, paper or paint. special nooks and can't be seen. you to keep clutter to a minimum. Rustic to Traditional to Formal Contemporary. and overall feel of your room. storage solution fits your needs. items easy to retrieve and replace? that the items are easy to track down? organizers for every room in your house. your own, with things you have on hand. returning items to their storage locations. remains on display, and hidden storage remains hidden. I do with the odd, out-of-place space? space to allow it to flow to the rest of the room. will only draw attention to the space). and use it as a hidden storage solution. home! It’s also a great place for exposed storage. of cubicles under your stairwell. shelves and display a few treasured items on them. them with family photographs and knick-knacks. out what to do with all that extra time? !